Stele with image of Parashurama. 24 January 1790? 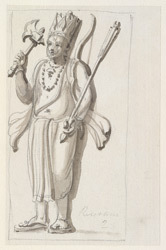 bl.uk > Online Gallery Home	> Online exhibitions	> Asia, Pacific and Africa Collections	> Stele with image of Parashurama. 24 January 1790? Parashurama ('Rama with an axe'), is the sixth main incarnation of the god Vishnu who assumed this aspect to re-establish the social order disrupted by unruly clans of kshatriyas and of helping brahmins to gain the power over them.